In our previous home, our master bedroom never got painted. It stayed builder-grade white walls for four years until we sold the house. We put all of our focus and energy on the rest of the house. And I'm pretty sure, we aren't the only ones. That's depressing. So, when we moved into this home, the master bedroom was going to be the first room we tackled (and I mean, very first, since we painted it within a few days of living here). 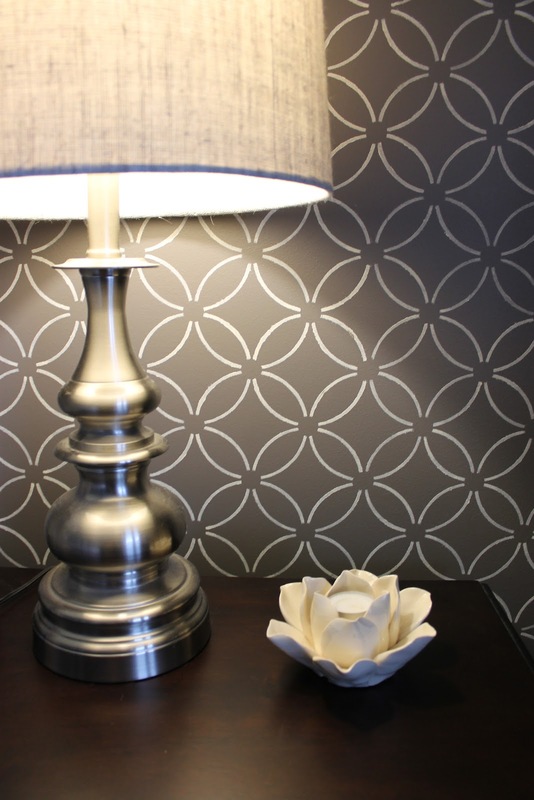 I recently showed you the makeover of the accent chair for our master bedroom, and a sneak peek of the stenciled wall. But, today I am revealing the whole room to you! When we first took possession, the room literally felt like you were inside a cardboard box - beige walls and matching beige carpeting. Some people prefer a lighter, more airy bedroom, but I prefer it dark and cozy. Especially since I need zero light in order to sleep at night. Since the headboard is a similar colour to the wall colour, I decided to stencil over the dark grey walls with the Fuji stencil from Cutting Edge Stencils. I followed the same technique that I had used in the powder room (you can read about that here). 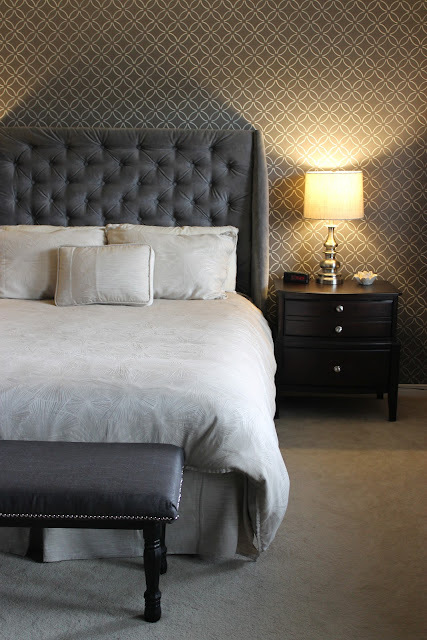 The headboard was a DIY project that my husband and I undertook. I had wanted a tufted upholstered headboard, but at the same time I wanted a wingback headboard. So, I decided to combine the two into one and make this 5' tall beauty. Unfortunately, I don't have a tutorial for this project since it was completed about a year ago. I followed a tutorial from Addicted 2 Decorating on how to create a diamond tufted headboard. We then adhered foam, batting, and upholstered fabric onto the side panels, and attached to the board with large L-brackets (the side panels were the hardest and longest part of the project). Since we live in Canada and winters can be bitter cold, we decided to include an electric fireplace in our room. It also doubles as a entertainment console. It heats up the room very quickly, and is a must to make the room toasty warm before curling into bed at night during the winter. Here, you'll see the accent chair that we gave a makeover. You can also see in this picture, a hallway that leads to the ensuite bathroom (this room is on our long list of things to do). On either side of the door to the ensuite are his and hers closets (you can see my master closet reveal here). The bench at the foot of the bed was another DIY project that we completed for this room. I didn't take any in-progress pics of this project either since it was finished last year, but I recently completed a similar bench for a client's home, so you'll be able to see that in a later post. stencil paint - Folk Art craft paint in "Tapioca"
If there is anything in the source list that I may have forgotten and you're interested in knowing more, please let me know. What does your master bedroom look like? Is it dark and cozy, or light and airy? Hi Audrey! Thanks for the positive feedback :) We did sell our townhome last summer and moved into our single home in the fall, so we have been in this home a little less than a year now. I have lots of dreams for this home, so this blog is a good way to showcase that. Stopping by from Thrifty Decor Chick! This is absolutely stunning. I love the dark wood and walls paired with the white trim. Great work. Thanks Paige! I love how it turned out - it was worth all those long hours. Love your bedroom!!! I was thinking about stenciling the wall behind my bed, and after seeing yours I am going for it. We have a rectangular window on each side of the bed, so it wouldn't have the same impact as yours. Yes, our room is very dark at night and I love it that way. Can't wait to check out the rest of your lovely home. Thanks Karen! I love the impact that a wall stencil (or wallpaper for that matter has on a room). I also stenciled my powder room with an allover trellis pattern. It definitely makes a difference! Good luck on your stencil project! Stopping by from Thrifty Decor Chick to say that your bedroom is gorgeous! I love everything about it, especially that stenciled wall! LOVE! Thanks Raechelle! I appreciate the nice words! Your bedroom is beautiful. I love the headboard! The stenciled wall is fabulous. Thanks for stopping in Dee! Thanks Robin! The headboard and bench were fun DIY projects that my hubby and I completed, and the stencil was a labour of love! Just popping over from Thrifty Decor Chick1 I can't believe you get to live in this room, it is beautiful! Good job on the makeover! Thanks Colette! Such a nice thing to say! I didn't see a picture of the ceiling fan. I love the gray and the geometric pattern on the wall! Your room looks like something out of a catalog! Gorgeous and very rich looking! Thanks for the nice words Cindy! did you use same fabric on headboard and bench? Beautiful work! We're in the decorating stages of our master bedroom renovation, I'll be posting pics on my blog when it's complete! Great inspiration, thanks for sharing!